Havanese Dog Breeders Colorado - FUZZYPUPS! 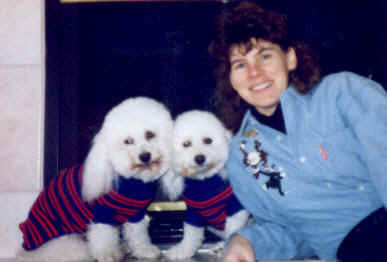 In 1991 our family adopted Belle, our "perfect" Bichon Frise, and had our first litter - 5 perfect girl puppies - in 1993. With placement of puppies into new homes, we volunteered to babysit puppy children when the owners traveled on vacation. This fun hobby turned into an idea of a new full-time profession, and in 1999 we moved to a 36 acre ranch just east of Parker. With an incredible following of loyal dog-lovers, our resort has prospered and become a one of a kind resort for small dogs. We have had the privilege of being featured on "Animal Planet", "Channel 7", "Channel 9", the "Rocky Mountain News", "The Denver Post", and "The Westword". Fuzzypups! goal is to place "perfectly perfect puppies"; we now proudly do so with Havanese, "the dog of Cuba". Once a puppy is placed he will need regular spa visits as well as a place to go when his family travels. Our grooming and boarding facilities can do all that with style. No worries, you don’t have to be a Fuzzypup! to come for boarding or grooming. We are happy to pamper most small breed pets. Enjoy your visit to our web site, and schedule a trip to see for yourself what we are all about.